August 26, 2017 Robert W.
Low cost retractable banners in Vegas are great for exhibitions and tradeshows in Las Vegas. 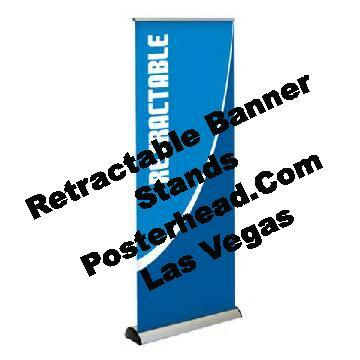 Las Vegas is the most popular place to hold exhibitions and trade shows and many retractable banners are needed for the exhibit booths. Las Vegas offers great deals on signs because of the volume of signage required for the shows. This volume of signs allows for bulk sign purchasing that can allow for savings to be passed on to customers. In addition, many vendors prefer to have their graphics made in Vegas to avoid the hassles of shipping and damaged goods with no recourse. Las Vegas hosts hundreds of events and shows every year and the retractable banner stand is one of the most popular graphics at these shows. 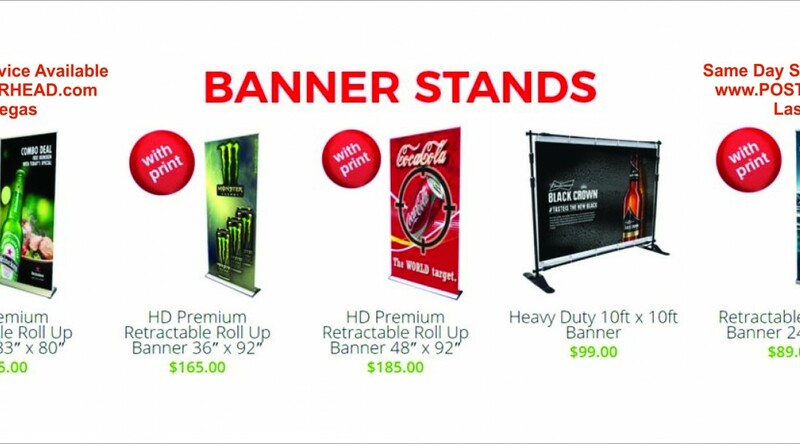 Many different retractable banner stand models are offered ( http://posterhead.com/bannerstands/ ) under $100.00. Also, premium or luxury retractable banner stands can be purchased at a higher price. All these retractable banners come with a carrying bag and an adjustable pole that allows for height adjustment so that the banner can be displayed at the perfect height. In addition, many sign shops offer delivery service to the convention venues as well as Lyft ( www.Lyft.com) and Uber ( www.Uber.com ) offer pick up service as well for a small fee. Low cost retractable banners in Vegas are printed on a 13 ounce matte vinyl banner material with eco solvent inks that are designed for indoor and outdoor use. These inks are environmentally safe, but yet produce prints that are vivid and colorful. These retractable banners are offered in many sizes to accommodate you marketing display needs and exhibit booth limitations. Low cost retractable banners in Vegas can be purchased at local sign shops that can produce these banners very quickly and inexpensively. Contact a sign shop today and get your ordered through the professionals. August 26, 2016 Robert W.
Stand up banners for Las Vegas trade shows are one of the most popular display graphics at conventions and trade shows. These vertical banners are compact when not in use and very easy to transport from show to show and can be used many times. Depending on the banner stand, just the graphics can be changed out instead of the whole banner stand, thus saving money. There are hundreds of trade shows that take place in Las Vegas every year. Millions of attendees attend these shows to learn about products and services of the companies that exhibit. In fact, Las Vegas is the number one destination for trade shows and exhibits in the world. There is so much fun to be had in Vegas that everybody wants to have their conventions here. Consequently, there is a huge demand for display graphics for the trade shows. There are basically 2 types of stand up banner stands. One type is called the retractable banner stand where the graphic print is actually encased in an aluminum case and then pulled out of the case utilizing springs for tension. A fixed pole or an adjustable pole is used to hold the banner upright. When the pole is removed, a spring retention system in the aluminum case retracts the banner in a compact roll. A X Stand banner stand is a system of poles ( much like a system of poles on a dome tent) that puts tension on the poles and the graphic print is attached to these poles to keep it stretched. The X Stand banner stand can have their graphics replaced while normally the retractable banner stand cannot. The advantage for the retractable banner stand is that it is more compact and takes up less space to display. Stand up banners for Las Vegas trade shows can be found at various sign shops in Las Vegas. January 16, 2016 Robert W.
Las Vegas vertical pop up banners are great for conventions and presentations. These Las Vegas vertical pop up banners are compact ( they fit in a carrying case) and expand to a large size for impressive graphics that will help you emphasize your products or presentation. Las Vegas is a very popular destination for exhibits, trade shows and conventions. There is so much to do in Las Vegas and so much to see that everybody wants to come to Las Vegas for their shows and the people attending the shows use it as an excuse to come to Las Vegas and have fun ! Consequently, Las Vegas sign shops keep busy making banners and graphics year round for all the trade shows that occur in Las Vegas. Las Vegas vertical pop up banners are the most popular graphic at the shows because they can be set up so easily by one person and used over and over again. The x-stand banner stand, as shown in this You Tube video , https://www.youtube.com/watch?v=OkjZ9glitnU, shows how affordable these vertical banner stands can be. In addition to x stand banner stands, the retractable banner stand is another popular graphic at the conventions. These 33″ x 78″ are great and compact graphics that display really well at the shows. 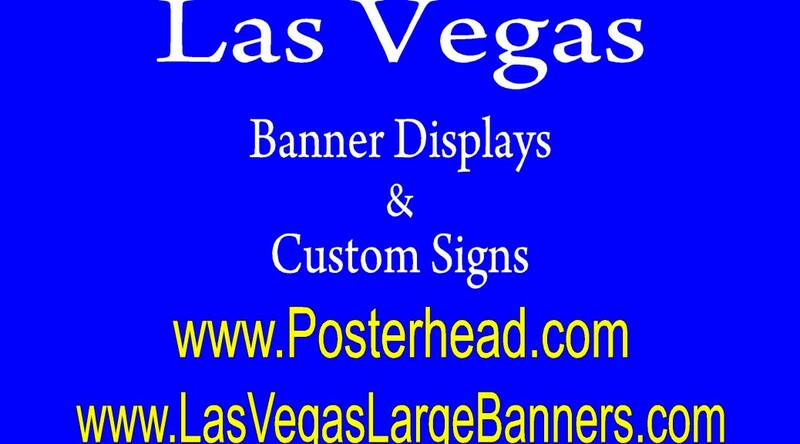 For extra large graphics, try www.LasVegasLargeBanners.com . They do really large banners. Las Vegas vertical pop up banners are printed on a matte material so that they produce no glare or flashback if people take pictures. A gloss banner would reflect light and can ruin a photo. Latex or eco solvent inks are used so that the colors are bright and vivid. These popular banners can be found at local sign shops in the Las Vegas area at very reasonable prices. Simply Google a search request and find a sign shop near you that can get you these affordable display graphics.